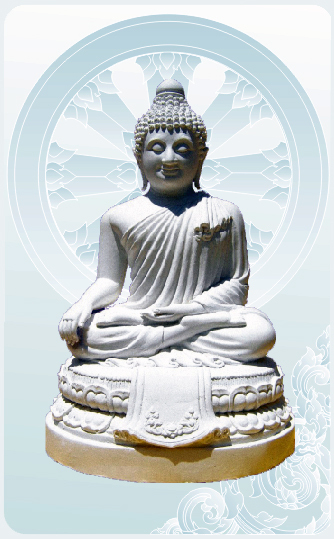 When creating Buddha's statue is the worth remaindering that the Buddha attained Nirvana. Historical, Buddha was born as the son of a king but decided to renounce his luxurious life and became a perfectly enlightened being who has achieved the highest knowledge of truth. The Buddha, Great teacher in Buddhism, taught Dharma for the world. The teaching of the Lord Buddha is to avoid all evil; to do good; to purify one’s mind. Buddhist followers associate morality to bring about harmony and happiness in their lives. A plot of land on the top of Mount Nagakerd with beautiful landscape views of Phuket and surrounding the Kittisangkharam Temple was donated by faithful Buddhist followers. The area is large enough to enshrine a very graceful Buddha statue. Kittisangkharam Temple, the temple committee, people and Buddhists have agreed to create the project of creating “Phraphutthamingmongkhol-akenagakhiri” to worshipped and represent Lord Buddha. On this site will also be a magnificent park where people can relax and meditate. This pleasant place is very appropriate for Vipassana (insight meditation). The eighth national plan of economic and social development between 1997 and 2001 chapter 3 focused on the mental development of youth and people. In addition, the ninth national plan of economic and social development between 2001 and 2006 mainly focused on natural resources and human environments innovations. But to approach the real issue: Nature should be brought into our lives thus allowing Dharma to cultivate our minds. The committee, who has understood this significant idea, designates the project by constructing Buddhist park and enshrining “Phraphutthamingmongkhol-akenagakhiri”. This place will be used for meditation and will assist development towards wisdom and peace of mind. In addition, the Great Lord Buddha who, with love and goodness, eliminated evil and is worshipped and respected will be presented to His Majesty the King Bhumibol Adulyadej for the royal charity. What should we achieve in life? Is there anything in the world without capital foundation? Buddhist followers seek the paths to release miseries, meet the path of sustainable happiness. As we create the huge Buddha statue on the top of Mount Nagakerd, Phuket Province, that is perception of mind, way of making merit, accumulated good, legend of land. This significant occasion is to perform faith, mercy, wisdom and accumulated cooperation, peace and a love for the nation, the religion as well as the king for us, others and this fortune place. Buddhist followers were born arising from the capital foundation. The committee would like Buddhist supporters to understand the purpose of creating the huge Buddha statue. There is a saying- To create the Buddha image, to cultivate humanism, to build the nation, to present to His Majesty the King Bhumibol Adulyadej for the royal charity, to present to paternal of the land. The great goal is Buddha’s Dharma performed in mind and society. 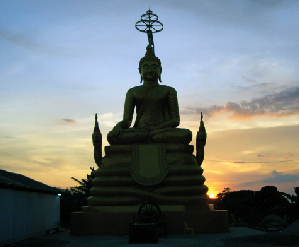 To consider the world of Buddha’s teachings as the teacher of gods-Indra, Brahma, and to penetrate to the real teachings as well as to be free of heedlessness or carelessness, we should practice Maha-satipatthana, the way of Bodhipakkhiyadharma with Vipassana meditation as teachings- giving, disciplining, cultivating- to reach Trisikkha composing precept, concentration and wisdom. We can attain the utmost Dharma- miseryless, leading to see clearly the three characteristics- impermanency, suffering, non-self as well. Any Kusala or merit acquiring from this practice is a form of respect to the Buddha, giving three brilliant worlds. Any Kusala or merit acquiring from this practice is a form of respect to the Buddha, giving three brilliant worlds. May those of Buddhist followers have contributed, labored, thought to erect the Buddhist park for mind legacy of the world dedicated to Lord Buddha be blessed with achievement arising from the assembly of austerity practice, power, strength, worshippers and participants be blessed with long lives, well-being, strength, wealth, intelligence, happiness , property, fruitful efforts of good doing and safety travelling as a whole.